“Why are you here?” he demanded, his gaze coming back to her face once more. “You have to ask?” she whispered, hurt. His eyes! They were clear and sharp and mesmerizing, in person. She had liked them before. Now they were even better. They weren’t black. They were a dozen shades lighter than black, a grey colour that was neither light nor dark, but enticingly different. There was a soft cheer at that. Chloe glanced at him. “Coffee is a treat?” she asked. “You’re leading these people,” Chloe breathed, as she put it together. “Someone has to,” he said flatly. He got to his feet. “We can’t talk here. They’ll tap my shoulder every thirty seconds now everyone is awake.” His scowl deepened. “They forget everything,” he added, sounding peeved. “They have you to remember it for them,” Chloe replied. Other brilliant read from Tracy that captivates you from the very beginning as we look at the potential of a rebel uprising in a fictitious Latin American country. Passion, action, horror, tragedy and adventure are all beautifully and masterfully woven by Tracy to provide maximum reading entertainment. The characters are fantastic and the story line, well let’s just say it is very new and fresh. Lots of intrigue, excitement, mystery, and, of course, some romance as well. They have known and loved each other for years, but they have never met…until now. When Cristián Peña and the entire town of Pascuallita vanish, Chloe Masters, former hacker and free spirit, races to the war-torn island to find the man who saved her life years ago. She has never met Cristián in person, yet she loves him, anyway. There’s a drone carrying a dirty bomb, heading for the Whitehouse. No one knows who is controlling the drone. Cristián and Chloe, with their extraordinary talents, just might be able to stop it. Cristián lives under the shadow of his famous older brother Duardo, which makes him doubt everything, including his feelings for Chloe. Cristián must find a way to step out of that shadow, if he is to save his family, the people of Pascuallita, Vistaria…and Chloe. I have reached the last page of book 6 (V-Day). I'm sad to see it end but if you are looking for a good series that has some romance, comeuppance, suspense, action and a lot more.....I recommend this whole series. Like V-Day, each book has it's own story but it also continues the main story line about a countries revolution and how it relates and entangles each character. As all the other books in the series, it was a grab your attention and keep reading and turning the next page. I have enjoyed this series and am sure will be reading it again. I really liked this book but unfortunately it was the first one I read in this series. This made is very confusing as there were many characters. I can understand that for readers who have read this complete series it was a satisfying end as all the main characters returned. I personally had trouble following the plot. So in conclusion, this series is certainly worth reading but read the books in sequence. A great read, there’s so much action and romance! It’s very satisfying to have all the loose ends gathered together and all the various mysteries explained but sad to reach the end of the series!! With so many couples thrown together by a country torn apart by war it’s lovely to read more about each couple who have featured in a book previously. We learn more about them and can enjoy the interactions between the well-known and new characters. The story of the two romantic leads of this book has a lot told in retrospect as they are finally meeting after years of email and then video correspondence online. Their first meeting and their in-person relationship is further challenged by the timing: guns blazing and technical challenges abound in a country that has come to the critical stage of a war! The plot twists and turns, as well as the the unpredictable and sometimes illogical actions of key players on both sides of the war, make this book and the series as a whole a very captivating and compulsive read!! Tracy Cooper-Posey has slam-dunked another great book and a beaut way to finish the series! 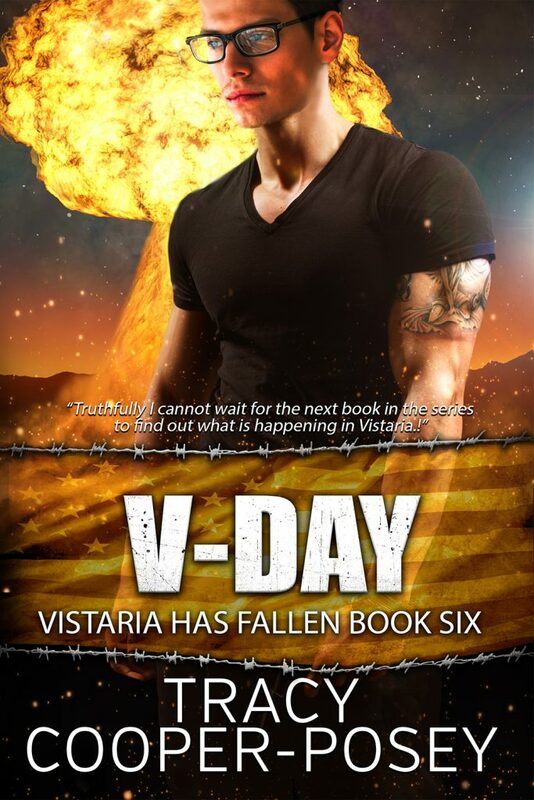 ​I highly recommend reading the series in order, as each book introduces additional characters and builds understanding for the development of the war in Vistaria over the course of the six books. I loved this series from start to finish. My biggest worry was to be left hanging wanting to know what happened to someone. Well you finished it off perfectly Tracy! Great job! Romance and suspense all in one series. Best books I have read in years.